Moist and rich, with a hint of toasted almond, this cake's fabulous texture will change the way you think about gluten-free. Note: You must use an electric mixer to make this cake; mixing by hand doesn't do a thorough enough job. To make the cake: In a medium bowl, whisk together the flours and xanthan gum. In a separate bowl, use an electric mixer to beat together the sugar, butter, oil, salt, baking powder, and vanilla and almond extracts until smooth and fluffy. Scrape the bottom and sides of the bowl once to incorporate any unmixed ingredients. Beat in the eggs one at a time; the mixture should become quite fluffy and light. Scrape the bottom and sides of the bowl, and beat briefly. Gently stir in the milk alternately with the flour mixture, one-third at a time, ending with the flour mixture. Scrape the bowl once more, and gently beat for 1 minute. Thoroughly grease a standard-size Bundt pan. Scoop the batter into the prepared pan. Bake the cake for 50 to 60 minutes, about 3 to 4 minutes past the point where the cake springs back when touched lightly in the center and a cake tester (or toothpick) inserted into the center comes out clean. The finished cake's internal temperature should be 210°F or higher. Remove the cake from the oven, and cool it in the pan for 15 minutes before turning it out onto a rack to cool completely. To make the glaze: Whisk the glaze ingredients together and drizzle over the cooled cake. I just took this out of the pan & it looks perfect! I followed the directions about using melted shortening, brushing it all over the inside of the pan & sprinking with granulated sugar just before putting the mix in. I baked it for 51 minutes. The taste and texture are lovely and indistinguishable as GF. I could serve this to anyone without apology. I carefully painted melted crisco onto my bundt pan, but forgot the sugar you recommend to dust the crisco with before putting in the batter. The cake stuck, although the pieces were replace-able and cover-able with the icing. Tightly wrapped, it was still very nice two days later when the last of it disappeared. This recipe is amazing. I followed the baking directions exactly, being sure to whip up the butter/sugar mixture to very fluffy both before and between adding each egg. I have a gluten sensitivity AND a dairy allergy; I substituted KAF GF Measure for Measure flour instead of the GF AP flour + xanthan gum, Earth Balance Vegan Buttery Sticks instead of butter, extra virgin coconut oil instead of vegetable oil, and Good Karma Flax Milk + Protein in place of the milk. I baked in a gas oven at 325 for about 55-57 minutes last night, letting it cool for a few hours before putting it in a ziploc bag to bring in to work today. OH MY GOODNESS, this cake turned out AMAZING! I took a bite this morning and was astonished at how tender, moist, and deliciously pound-cake like it is! It's been about a year and a half since I've gone gluten-free, and I think this might be one of the best cakes I've ever made, or eaten - EVER. I really can't tell it's gluten-free. Even my boss, who also recently discovered she has a gluten allergy, said I knocked it out of the park with this one. We're both going to have to exercise serious self-control to not polish off half the cake by the end of today.... This recipe will be a go-to for sure!!! For Christmas last year and this year, I've turned this into a hazelnut spice upside-down bundt cake. I am not gluten-free, nor is my family, so I subbed in plain flour for the flour and xanthan gum. I then use hazelnut flour instead of almond, turbinado and coconut sugars instead of cane, and add plenty of spices into the batter. Then I liberally butter and sugar the bundt pan, put about three small pears, sliced, into the bottom, and bake. It's delicious and comes out looking like a wreath! I'm sure one could keep it gluten-free. Also, this year I prepared the cake batter the day before and kept it in the fridge until baking, and it worked great. Definitely one of my favourite recipes. 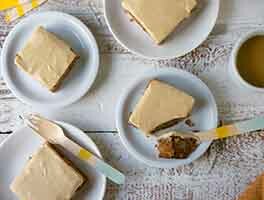 This is my go to GF cake recipe!! I am the only one in my family who is GF and my husband and kids are picky about GF baked goods (they won't eat them) Read the reviews and thought I'd give this a try - and WOW! I have made this for extended family, work fubctins and neighborhood gatherings and no one can tell it is GF. All they say is that it is delicious. I even used it to bake the layers for my parents 50th anniversary cake -it was dreamy. Thank you KAF for providing excellence in GF baking! Keep the GF recipes coming!! Made this cake to use up some almond flour and my son stopped by mentioning that he was going to a friend's house for dinner. I cut the Bundt in half and he quickly wrapped it up in foil to take. I hadn't even dusted it with powder sugar yet. He called to thank me and raved about the lightness and moistness of the cake and most of all the flavor! He was very surprised to find out it was GF. It is really yummy! Thank you to KAF and all the other reviewers- this recipe is a keeper. 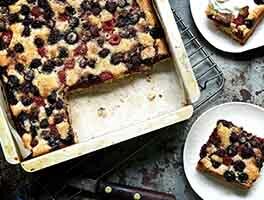 This is so delicious and an excellent recipe for GF desserts. I'm also sugar free (because of Keto). Does anyone have experience using Swerve or other sugar free sweeteners with this cake? I gave this recipe 4 stars (versus 5) because I had a challenging time getting it out of my buttered and almond floured Bundt pan. With that said, this is an excellent recipe. I made the cake for a neighbor with celiac disease. Otherwise, I do not routinely make gluten-free baked goods. The cake was dense like a pound cake, but the texture was heavenly. 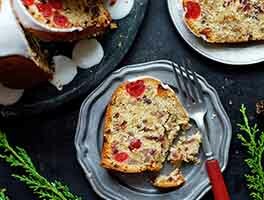 I made a couple of changes to the recipe, including substituting additional almond extract for the vanilla extract and adding a can of drained sweet cherries. I WILL make this again for my neighbor. 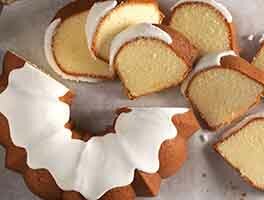 This bundt cake is so delicious! 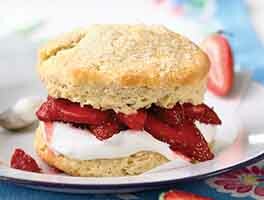 It's not too sweet and the crumb, with the addition of the almond meal, is just perfect. I used a cast iron fluted cake pan for this and it created a beautiful crust. I will make this recipe over and over. And by the way, not one person who tried this suspected it was gluten free.